For years now, I've been hearing how wonderful Lynn Austin's books are. And while I've had a few on the TBR pile, I haven't managed to squeeze them into my schedule. This year, I decided, would be different and made it a point to read her new release, While We're Far Apart. I love the title and the cover. And I ended up loving the book. But I didn't at first. At first, I struggled to get into it. A good 150 pages I think. Let me explain why I think that is. 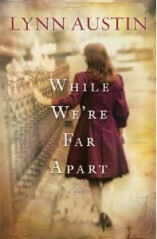 While We're Far Apart focuses primarily on three main characters and with little deviation devotes chapters to each of their perspectives in order, starting with 12 year old Esther Shaffer. Esther's father signs up to go to war and Esther and her younger brother, Peter, are devastated. It hasn't been that long since their mother died unexpectedly. She feels betrayed and alone. She doesn't want to stay with their grandmother who is ravaged with fear that all three of her sons are at war. Her duplex is so cluttered there's no room for the children, Esther believes. Enter Penny. Penny has always secretly harbored a crush on Eddie, Esther's father. She volunteers to watch the children in their apartment. Penny lives with her elderly parents who also live in constant fear and don't give Penny much of a life. So even though Esther resents Penny's interference, this arrangement is struck. Finally, there is Jacob Mendel, the Shaffer's landlord. His wife died alongside Esther and Peter's mother. His son is in Hungary, a place threatened by the growing influence of the Nazis. He spends all of his time trying to figure out what has happened to his family. While We're Far Apart is how all three of these individuals start in a place of loneliness and fear, and how through various circumstances they come together. It's about how we make new families of our choosing, how our burdens are best carried alongside others, and about having faith even when you are angry at God and certain He isn't working. It's set during World War II, and I'm actually not a huge fan of this time period. I think I have read so many stories set during this time period that I'm only interested when it's something really fresh. Additionally, the prose is not spectacular. It's not bad, it's just very functional. I think these were my main barriers to the book, though the beginning does start out slowly, as Austin lays the groundwork for her story. But I started to feel affection for these characters. I think that's the strength of this novel, the characterization. These are people you can imagine really existing, people just living their lives and trying to get through World War II, and all of the other things life has thrown at them. I also really really loved the realistic portrayal of American attitudes towards Jews. There's no sanitizing history, but rather the fear, and inaction of the American government towards what was happening is clearly shown. Sometimes there's a tendency to look at World War II through rose colored glasses, because it's a war that had the world's favor so to say. But the thing is, it was war and there are no purely "good guys". War is messy and unpredictable and as such there are terrible things done on all sides. I wish it was owned more often. I just love that there was not glorifying of America done here. But perhaps what I loved the most was the rich portrayal of faith and community. And I don't necessarily mean faith community, but the way faith and community blended in unexpected ways. Some of my favorite scenes, scenes that moved me to tears were when Jacob Mendel taught Esther and Peter about the Jewish stories and holidays and they celebrated them together. I love that this orthodox Jewish man, so angry at God, felt his heart soften and the first feelings of comfort in observing the rituals of his faith with Christian children. I loved the relationship between these three and Penny, the way a little family formed between these broken hearted, uncertain people. These stories, stories of people finding new ways forward and new family amongst others always move me. So I really enjoyed this book, for the characters I grew to love, for the hope and faith found within the pages, for the gentle reminder it was to me, that God works even when it seems He is silent. This is definitely an emotionally satisfying read.